Basement design all started when people realized they could use their basement for more than just a utility space to store the water heater, boiler, or breaker panel. Instead, they could turn the expansive space into a spare living room, bedroom, or common area, while also adding value to their home. It was revolutionary to think the cold downstairs that began as a cellar could actually be utilized. That’s why nowadays, people are so interested in turning their basements into a place people actually want to spend their time. Basement design trends have fluctuated over the years. Now that we’re approaching 2018, we want to supply you with some of the hottest new trends that are taking over the basement design industry. Below are the top 10 trends to look out for in the next coming year. Why pay $10+ to see a movie in a crowded theater filled with sticky floors, popcorn kernels, and candy wrappers when you could watch a movie from the courtesy of your own home? Having an at home theater in the basement is a popular trend that’s not going away anytime soon. Mini bars have been sweeping the nation ever since people realized how convenient (and less expensive) it is to make drinks at home. The basement is the perfect place to set up a wet bar with your favorite bottles, mixers, and a fridge stocked with ice cold drinks. And why not take it one step further? At home beer brewing and winemaking have been a trend on the rise -- especially in Colorado, which is known for its many microbrews. You could start a new business right out of your basement. Or just experiment with some friends to find the perfect amber ale or merlot. In Denver and the Metro Area, housing prices have been on the rise. That’s why people have been renting out rooms, apartments, or condos just get their mortgage paid. You could easily turn your basement into a rented space if you’re looking to make some extra cash. A popular solution to renting out the basement is adding a separate entry way, so the tenants can feel like it’s their own place. Who wouldn’t want a private place to jam with the band? Turning the basement into a private music studio is the perfect option for music lovers with neighbors. Because let’s face it, maybe your neighbors don’t like hearing you play the drums for a few hours every day. The basement is generally more soundproof or at least helps with sound dampening. If this the option for you, just keep in mind that power and safety must be accounted for. You’ll want a professional to check your electrical hookups and ensure everything checks out. Nothing says a good time like Sunday night football. Having a sports room is a popular trend that seems to only grow as the years go by. Creating a basement sportscenter is the perfect idea because when things get a little rowdy, you can cheer, spill, and be as wild as you want. You could also consider setting up multiple televisions so you can watch multiple games at once. It’s definitely a better alternative to missing a game or having to record it and watch it later. People like having a place to call their own. Whether it’s an office, a walk in closet, or even a bathroom -- it’s always nice to have somewhere you can go in your home where all of your favorite things are easily accessible. Having a basement is giving yourself or your loved one more real estate to fill it with the things you or they love. Using an open concept, a lot of homeowners are just looking to make their basement an open living space for family and guests. This can include a play area, small office, lounge area with a pool table or something fun for when company comes over. It can be any sort of extension to your home that you’d like. It’s such a hassle to make it the gym on a regular basis. Plus gym memberships can often cost a fortune. Why not turn your basement into your own personal workout space and save on driving to the gym, working out on used equipment, and paying hundreds to thousands a year? Do you love to cook? Sometimes homes come with pretty small kitchen spaces. Lately, there’s been a trend of including a kitchenette or some sort of beverage center in the basement. Generally, the basement kitchenette is a smaller part of the larger basement living area. So it doesn’t take up a lot of space, but it’s still convenient to have and easily incorporated into a bigger design. To add value to your home, you could put in unique floor plans, a new room design, custom cabinetry, or architectural details. All of these personalized services can be made possible with Custom Integrated Designs Ltd. Plus through exceptional attention to detail, you’ll have the best basement on the block. For all of your basement design, finishing, and remodeling needs, Custom Integrated Designs Ltd. (CID) is there to help. 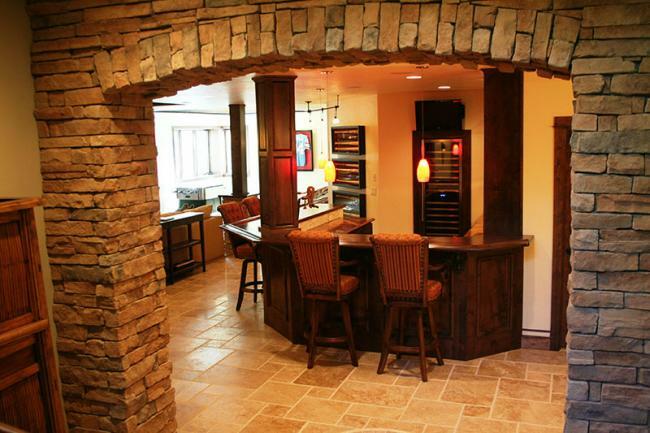 Even today, CID is still the only basement remodeling company that also offers custom wet bars, entertainment centers, and additional custom built-ins directly from its own woodshop. So if you’re ready to take your basement to the next level, contact CID today!